With rap newcomers dominating the weekend's roster, UK grime veteran Skepta emerged victoriously to a massive, Sunday afternoon crowd, proving that great rap gigs don't need lasers and lights to create a lasting impact. 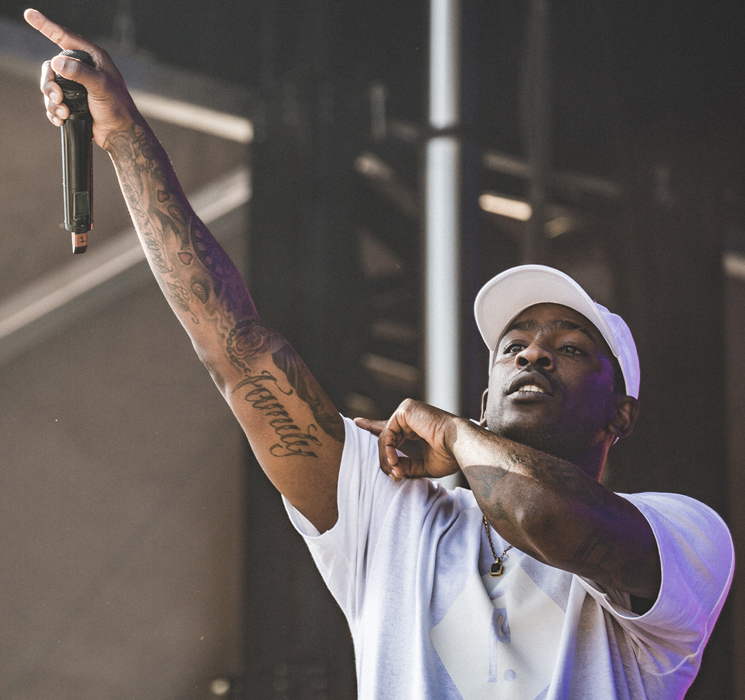 Touring in promotion of his newest, critically acclaimed release Konichiwa, Skepta took to the stage dressed in sweats, as the opening for the album's title track blasted through the Osheaga valley. Armed with an excellent hypeman and DJ Maximum, "straight outta London," the English MC moved through the tracks off Konichiwa at a languid pace, allowing for the levelled, clear delivery of each verse to be understood and ultimately absorbed. And while grime is characterized by this sense of vocal control, Skepta nonetheless surpassed expectations, demonstrating just how it could, and should be done on this side of the Atlantic. From the single "Shutdown" to the heavy-hitting "Corn on the Curb," Skepta egged the crowd on, asking for them to band together and form what he called "energy crews" to keep the momentum. Despite the heat wave rolling through the festival grounds, Skepta kept his rabid audience at full attention from beginning to end, with security guards hosing down the concertgoers throughout the set.